"Family is what grounds me", shares Lynn Holmes. "Both before and after my diagnosis with Primary Lateral Sclerosis (a rare variant of ALS), I couldn't do without their support." Before her diagnosis, Lynn worked as a representative selling semiconductors for several high tech companies and lived in Connecticut. She went to college at night and weekends. "I received a BS in Computer Science from Sacred Heart University in Connecticut" Lynn stated. "But I wasn't finished with school quite yet! I received a Juris Doctorate from Quinnipiac University and became a lawyer, admitted to the Connecticut and California bars." She then took a position as a sales manager with a high tech firm, whichrequired a move to Philadelphia. "When I was promoted again two years later, I moved to Manhattan Beach, California" Lynn said. "As part of an international sales team, I was lucky enough to travel to Singapore and Europe. Among other responsibilities, I acted as a liaison between sales and legal on contractual issues." In 1999, she noticed some numbness in her left foot when she was walking along the beach. "I figured my shoe was to tight, after all- I'd gained a little weight" Lynn remembers, "I ignored the feeling". She left the Los Angeles area in 2000, moving back to Forestville, where she grew up, and where one of her three sisters, Tina, lived with her family. She started her own law practice. While jogging with Tina one day- "My sister noticed my left foot was dropping in a funny way. That the was beginning of my medical odyssey to determine why my body wasn't doing what I wanted", Lynn remembers. "One doctor exam lead to another, and one referral led to many referrals," Lynn says, "One test lead to so many tests, x-rays and scans- I almost lost track". 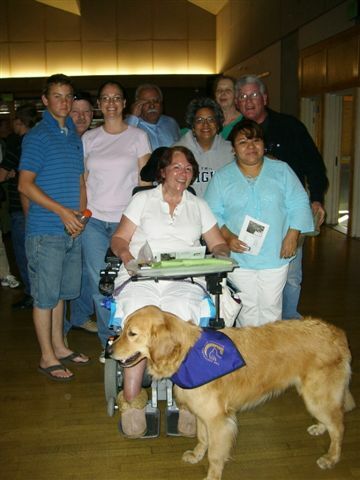 In 2001, Lynn was referred to The ALS Treatment and Research Center at UCSF. 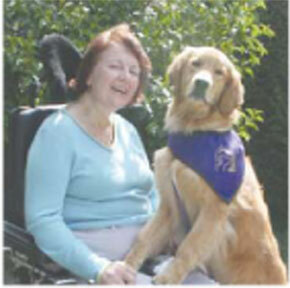 She was diagnosed with Primary Lateral Sclerosis (PLS), by Dr. Jon Engstrom and by Catherine Lomen-Hoerth. Lynn has written extensively about her disease and managing it on her website. "Unlike Multiple Sclerosis, I have no pain caused by PLS. Of course, falling over does cause pain. PLS affects the signals from the brain that control the muscles of the legs, arms, hands and voice. Unlike ALS, PLS does not effect the lung or heart muscles. So, PLS changes the way I live my life, but doesn't shorten my lifespan"
"PLS is progressive and I moved from a cane, to a walker, to a manual wheelchair, and finally to a power wheelchair. With a 20 mile range and a top speed of 5 miles, I zoom around! I was like a pinball bouncing off walls, through door jams and pinging off furniture, while I got used to the joystick controls. I only ran over my sister's toes twice, the cat's tail once, and got stuck in soft sand once. "PLS has one symptom that I take extra drugs for: uncontrollable or inappropriate laughing. Sometimes the smallest thing will set me laughing (running over my sisters toe or a joke) and I laugh long and loud, snorts and all. I guess laughing beats the other side of this symptom - uncontrollable sobbing & crying. "When I no longer could get up and down with ease or without falling over, I hired the housekeeper I always dreamed of. I have a caregiver who helps me save my energy for fun things. I've learned patience. I let others spend their energy doing the endless everyday little things, so I can conserve my energy for the important things - Having enough energy to participate actively in the lives of my family. "I still manage to go to my nephew's baseball games and now football games. 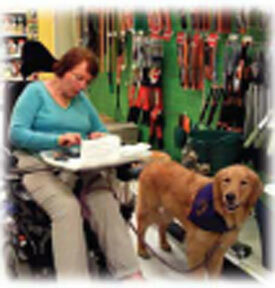 My assistance dog, Quixote is my most constant companion, helper, and caregiver. I am able to be alone during the day because of Quixote. I don't know what I'd do without him"
On Saturday, July 31, 2010, Lynn was one of the people at the San Francisco Giants 4ALS Awareness day, and that will be featured in the pre-game ceremony. "We are a family of Giants fans. When I lived on the east coast and my nephew, Mike lived in California, we watched games together, on the phone. Each would turn our TV's to the game and I'd call him. For the next 9 innings we'd 'watch' the game together and talk about the players! He taught me a lot. 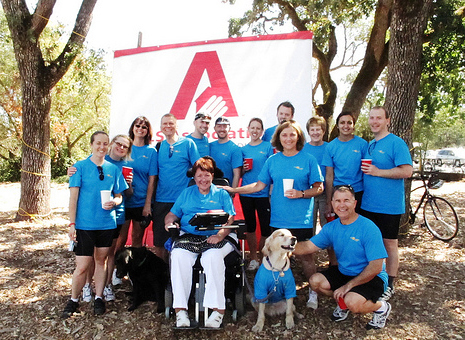 "After my diagnosis, I learned of the Giants were invested in increasing ALS awareness. I knew I had to put a face on this disease. I asked to be one of faces at this game. It is so important for the fans to see us and understand our connection to baseball. Lou Gehrig was an inspiration to us all." "My goal is make many memories with my family, friends and community as possible! This is a memory too good to grand to pass up!"